The Vatican is the world’s smallest nation, covering just 120 acres, and is a theocracy of just over 550 citizens, headed by the Pope, but its sightseeing complex is beyond compare. 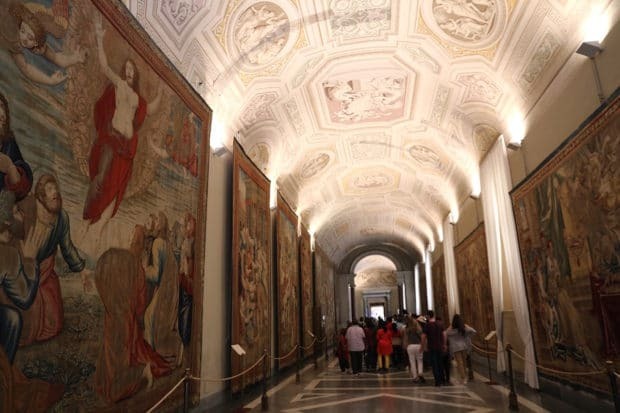 Within its walls are the ornate St Peter’s Basilica, the astonishing Sistine Chapel, apartments frescoed by Fra Angelico, Raphael and Pinturicchio, and some 10 museums. 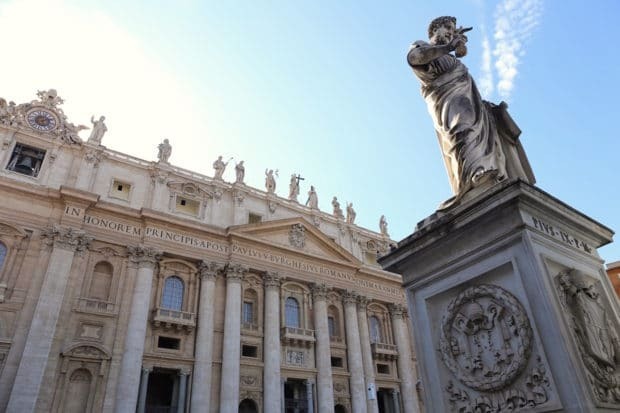 As the site where St Peter was martyred and buried, the Vatican became the residence of the popes who succeeded him. Decisions made here have shaped the destiny of Europe, and the great basilica of St. Peter’s draws pilgrims from all over the Christian world. I explored The Vatican one afternoon with Walks of Rome, a top notch local operator that specializes in educational small group tours. 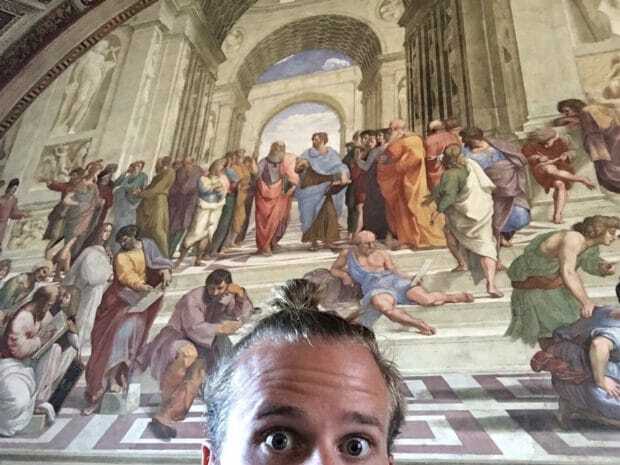 If you’re time crunched on your Roman holiday be sure to book one of their Vatican tours in advance. You’ll skip the excessively long line that wraps around the city walls and hop right through the VIP entrance. Giving you more time to enjoy the astounding art inside rather than sweltering in the heat for hours on end. The centre of the Roman Catholic faith, St. Peter’s draws pilgrims from all over the world. 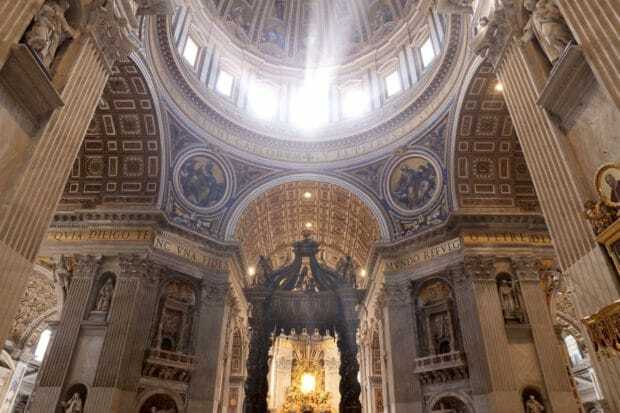 Few are disappointed when they enter the sumptuously decorated basilica beneath Michelangelo’s dome. The vast basilica’s 615 ft-long, marble–encrusted interior contains 11 chapels and 45 altars and a wealth of precious works of art. Some are salvaged from the original basilica and others commissioned from late Renaissance and Baroque artists, but much of the elaborate decoration is owed to Bernini’s mid-17th century work. This famous marble sculpture was finished in 1499 when Michelangelo was only 25. The statue was commissioned for the French Cardinal Jean de Bilhères, who was a representative in Rome. The sculpture, in Carrara marble, was made for the cardinal’s funeral monument, but moved to its current location, the first chapel on the right as one enters the basilica, in the 18th century. It is the only piece Michelangelo ever signed. The work depicts the body of Jesus on the lap of his mother Mary after the Crucifixion. The theme is of Northern origin, popular by that time in France but not yet in Italy. 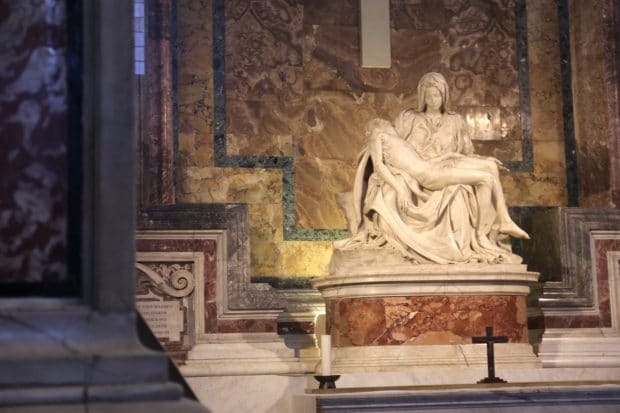 Michelangelo’s interpretation of the Pietà is unprecedented in Italian sculpture. It is an important work as it balances the Renaissance ideals of classical beauty with naturalism. One of the most beautiful mosaics in St. Peter’s, this altarpiece is a reproduction of Raphael’s ‘deathbed’ painting, now in the Vatican Museum. Giulio de’ Medici commissioned the painting for the the French Cathedral of Narbonne, but it remained in Rome in San Pietro in Montorio after 1523. Napoleon had it taken to Paris in 1797, and it was brought back to the Vatican in 1815. A team of six artists took nine years to execute the mosaic, finishing in 1767. The great painters last work features Jesus, bathed in light, borne aloft between Moses and Elijah, also in ecstasy, while the Apostles Peter, James and John, prostrate, contemplate this glimpse of paradise. On the left, almost hidden, are Sts. Felicissimus and Agapitus, who are commemorated on the 6th August, the Feast of the Transfiguration. 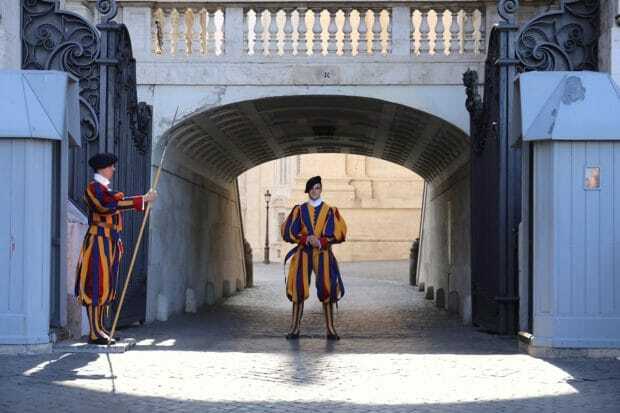 The name Swiss Guard refers to the Pontifical Swiss Guard of the Holy See stationed at the Vatican. The Papal Swiss Guard has a bodyguard-like role. Recruits to the guards must be Catholic, single males with Swiss citizenship who have completed basic training with the Swiss military and can obtain certificates of good conduct. Recruits must have a professional degree or high school diploma and must be between 19 and 30 years of age and at least 5 ft 8.5 in tall. The official dress uniform is of blue, red, orange and yellow with a distinctly Renaissance appearance. 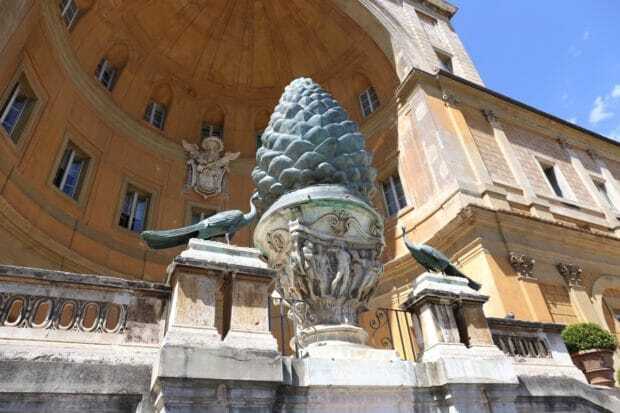 This huge bronze pinecone, part of an ancient Roman fountain, once stood in the courtyard of old St. Peter’s. It’s niche was designed by Pirro Ligorio. The bronze peacocks on either side of the fountain are copies of those decorating the tomb of the Emperor Hadrian, now the Castel Sant’Angelo. This area, which today holds many of the masterpieces of the Pio Clementino Museum, was once part of the loggia of the small palace of Innocent VIII Cybo (1484-1492) in Belvedere. The walls were once covered with frescoes showing landscapes and cities and in the lunettes there were small cupids painted by Pinturicchio and his assistants which are still visible today. 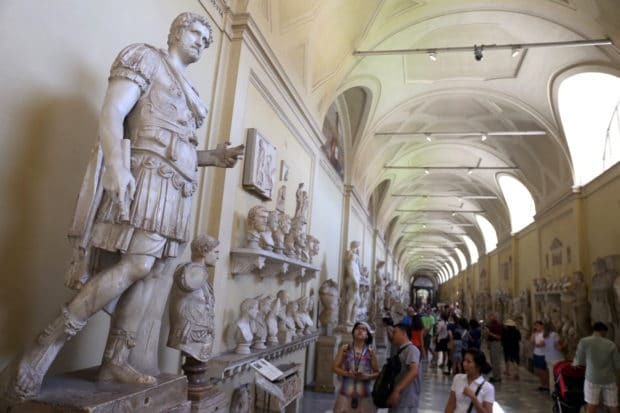 In the year 1771-1772 Clement XIV decided to include 1400s architecture in the museum he was setting up; the loggia was closed by walls with windows and at the end of the gallery the Hall of Busts was created. Between 1776 and 1778 Pius VI had the museum space extended towards the west entrusting the decoration of the vaulted ceiling of the new gallery to the painter Cristoforo Unterperger. 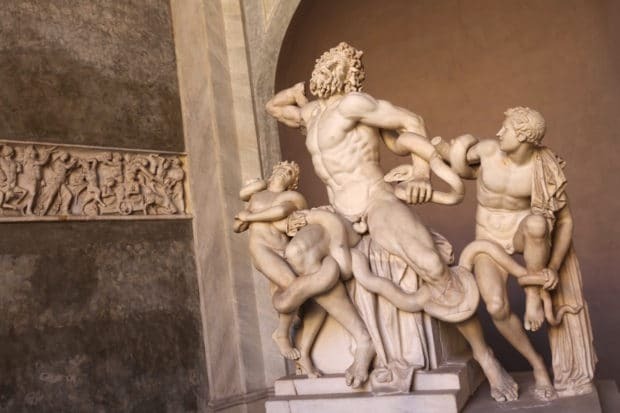 The statue of Laocoön and His Sons, also called the Laocoön Group, has been one of the most famous ancient sculptures ever since it was excavated in Rome in 1506 and placed on public display in the Vatican. The figures are near life-size and the group is a little over 2 m (6 ft 7 in) in height, showing the Trojan priest Laocoön and his sons Antiphantes and Thymbraeus being attacked by sea serpents. 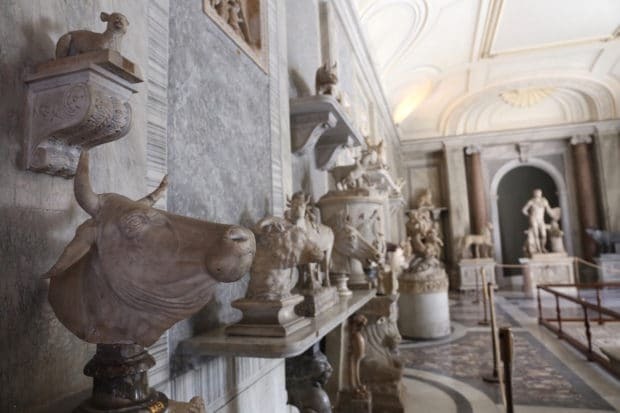 The display in the two rooms which together make up the Hall of the Animals was set up under Pope Pius VI (1775-1799) with antique works of art, often much restored and sometimes completely re-worked, with the aim of creating a ‘stone zoo’. Many artists worked on the sculptures in this display during the 1700s, the most important of whom was Francesco Antonio Franzoni. Works of art were selected for their links with nature and the chase. In this Hall it is the animals who are the protagonists, and can be seen both in curious interactions between one another, and also in relation to heroes and gods of the ancient world. Coloured marbles were used to allude to the colours of the coat or plumage of various animals or, by contrast, to confer a particular colouristic effect on a work of art. The Bronze Hercules here was discovered in 1864 near the Theatre of Pompey, where it had been carefully buried. The stone slabs that covered its grave were inscribed with the words “Fulgor Conditum Summanium”, indicating that the statue was struck by lightning, and buried on the spot. Attributes of Hercules: club, lion scin, and apples of the Hesperides. This hall, designed and built by the architect Michelangelo Simonetti during the pontificate of Pope Pius VI Braschi (1775-1799), came to constitute the entrance vestibule to the Pio Clementino Museum. Evidence for this remains in the Latin inscription Museum Pium above the imposing access, each side of which is flanked by an Egyptian style pillar-statue in pink granite, which date from the beginning of the 1st century A.D. 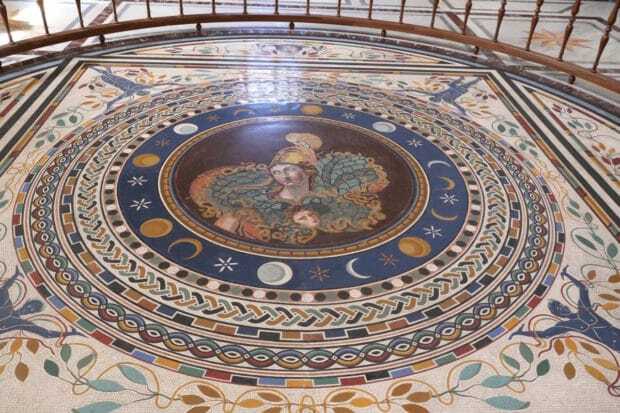 In the centre of the floor is a mosaic with a bust of Athena. 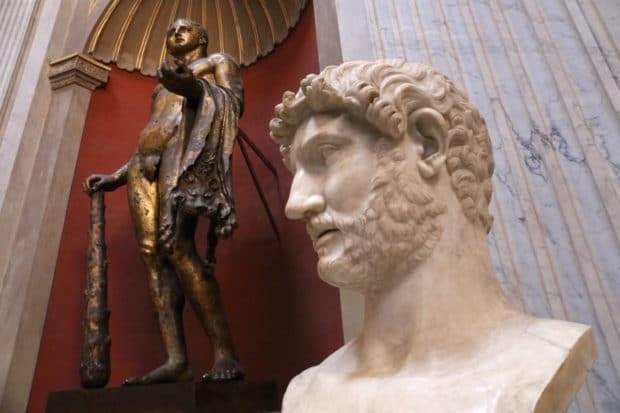 In the hall, dominated by the presence of two huge porphyry sarcophagi, there is also the Verospi Augustus, a portrait statue of the emperor in heroic pose, perhaps posthumous, and a statue of Gaius Caesar, a nephew of the same Augustus. Flemish tapestries, realized in Brussels by Pieter van Aelst’s School from drawings by Raphael’s pupils, during the pontificate of Clement VII (1523-1534), hang on the walls. They were first shown in the Sistine Chapel in 1531, and arranged for the exhibition in this Gallery in 1838. 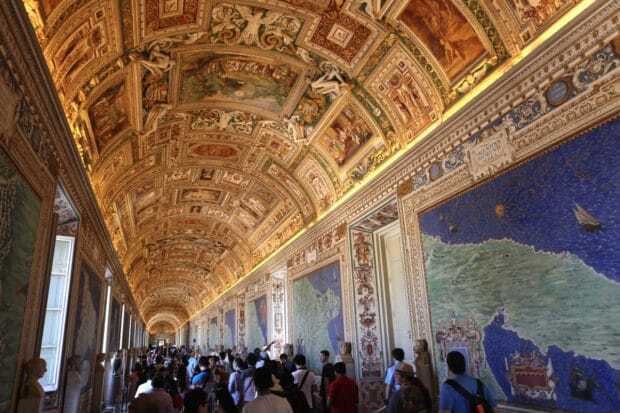 It takes its name from the 40 maps frescoed on the walls, which represent the Italian regions and the papal properties at the time of Pope Gregory XIII (1572-1585). They were painted between 1580 and 1585 on drawings by Ignazio Danti, a famous geographer of the time. Considering the Apennines as a partition element, on one side the regions surrounded by the Ligure and Tyrrhenian Seas are represented; on the other, the regions surrounded by the Adriatic Sea. The Immaculate Conception Room is located just beside the Raphael Room. 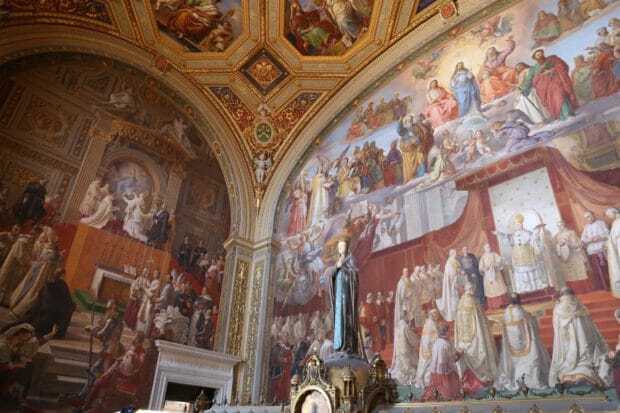 The room was planned by Pope Pius X who commissioned Francesco Podesti to make the various paintings displayed inside. Most of the themes that Podesti worked for on his paintings are on Roman art and academe which is commonly a subject of some help with dissertation and proper essay writing. Scholars have given significant interest about the Immaculate Conception and give high regard to the image in most of their written works. The School of Athens is one of the most famous frescoes by the Italian Renaissance artist Raphael. 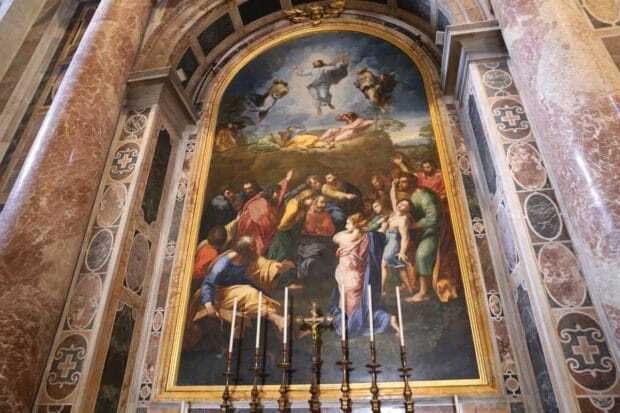 It was painted between 1509 and 1511 as a part of Raphael’s commission to decorate the rooms now known as the Stanze di Raffaello, in the Apostolic Palace in the Vatican. The Stanza della Segnatura was the first of the rooms to be decorated, and The School of Athens, representing Philosophy, was probably the second painting to be finished there, after La Disputa (Theology) on the opposite wall, and the Parnassus (Literature). The picture has long been seen as Raphael’s masterpiece and the perfect embodiment of the classical spirit of the Renaissance. Most visitors to the Vatican Museums finish their tour at the Sistine Chapel (a spectacular finale!) 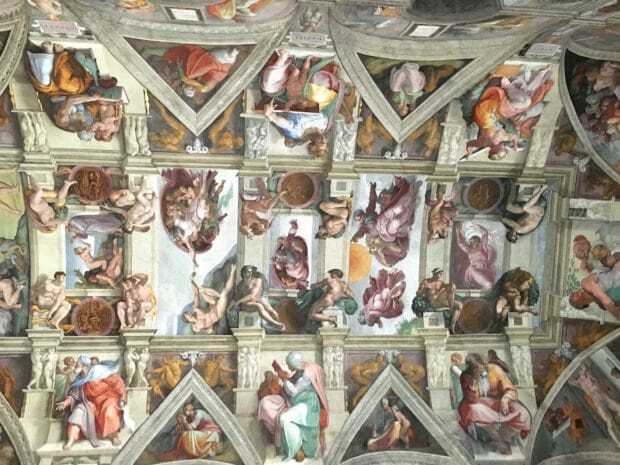 Michelangelo frescoed the ceiling for Pope Julius II between 1508 and 1512, working on specially designed scaffolding. The main panels, which chart the Creation of the World and Fall of Man, are surrounded by subjects from the Old and New Testaments – except for the Classical Sibyls, who are said to have foreseen the birth of Christ. I was so thrilled to finally find myself staring up at the infamous work. In university I studied Italian Renaissance Art History and conducted a research project on the ceilings restoration which took place in the 1980s. The chapel had been previously darkened with soot and today after painstaking restoration reveals colours of an unexpected vibrancy.